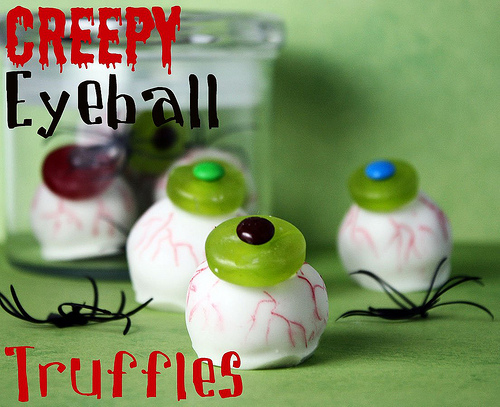 Eyeball themed food is perfect for Halloween because nothing is quite as gross and creepy as an eyeball treat. Confessions of a Cookbook Queen whipped up these peanut butter eyeball truffles. They look like pretty tame eyeball snacks until you break them open. You can check out the grossness that lurks inside to creep you out on Halloween HERE and you can check out all of my other favorite eyeball Halloween food HERE. Well I know what I'm making for the classroom this Halloween, those are awesome!